Hanbury Manor, with its fragrant walled gardens, stately Jacobean country house and 200 acres of Hertfordshire hotel parkland, the historic Manor Marriott Hotel & Country Club makes a lasting impression. As London’s time-honoured “Original Country Retreat”, you’ll find the obliging service and amenities expected from a luxury hotel in Hertfordshire, UK. There’s a standard that extends from the richly panelled library warmed by an open fireplace to elegant guest rooms each designed offering plush new bedding, business-savvy touches, high-speed Internet and flat-screen LCD TVs. 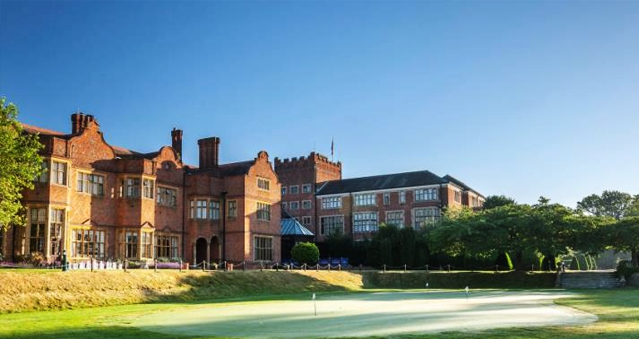 Amenities at Hanbury Manor include an 18-hole golf course, free parking and a heated indoor pool. The hotel also a cocktail bar, 2 upmarket restaurants and a spa with a fitness centre.